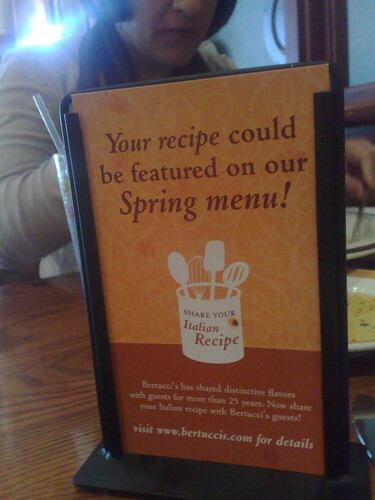 Bertuccis User Generated Recipes, originally uploaded by shashiBellamkonda. Enter the Bertucci’s Italian Recipe Contest! Bertucci’s is inviting our guests to put on a chef’s hat and apron and share a recipe with us for our “Share Your Italian Recipe” contest. A team of judges led by our Executive Chef Stefano Cordova will judge all recipe submissions based on the contest criteria as well as the recipes’ originality. Finalists will be chosen from the following five areas: MA/NH/RI, Hartford, Philadelphia, Baltimore/DC, NY Metro. One dish from the five finalists will be chosen as the winning recipe and will be featured on our menu and the winner will receive a $250 Bertucci’s gift card and memorabilia.